During the time of Buddha in Shravasti, there was a beggar woman named Nyenga who had nothing to offer to Buddha. She went door to door begging for oil to make a butter lamp. Finally, she was able to offer a single lamp in the temple among hundreds of other lamps. She, then, made the heartfelt aspiration: “ By this light offering, may I achieve the same wisdom as Buddha Shakyamuni, the arhats and all enlightened beings, completely dispelling the darkness of ignorance of all sentient beings.” Then she left the temple. Throughout that day, among the hundreds of lamps gradually burned out. Hers was the only lamp glowing still towards the end of the night. At the time, Buddha entered the temple, he said: “ don't try to put out her lamp light because there is no way to do so. Even the water from four oceans, and stormy wind, you will not be able to put out this lamp light. This lamp was offered by a beggar woman who dedicated this lamp for the enlightenment of all sentient beings, so her Bohicitta aspiration can not be interrupted. “ The Buddha then make a prophecy that she will be enlightened in the future and became Buddha named The Lamp Light. 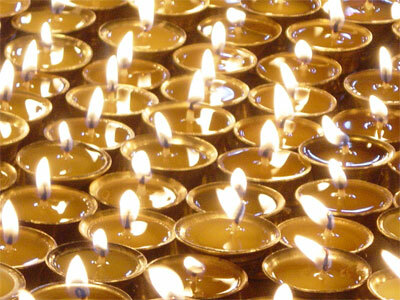 From the story we learned that the inconceivable merit will be generated by offering lamp light and the wish will be fulfilled when we wholeheartedly pray to Buddha with pure motivation for one and others.